If you threw a rock into the early 1960s music scene, you would hardly go a yard without hitting dozens of dreamy girl groups. That was the heyday of bands with Phil Spector-pioneered groups like The Blossoms and the Ronettes, in addition to groups like the wonderfully-named The Shangri-Las. 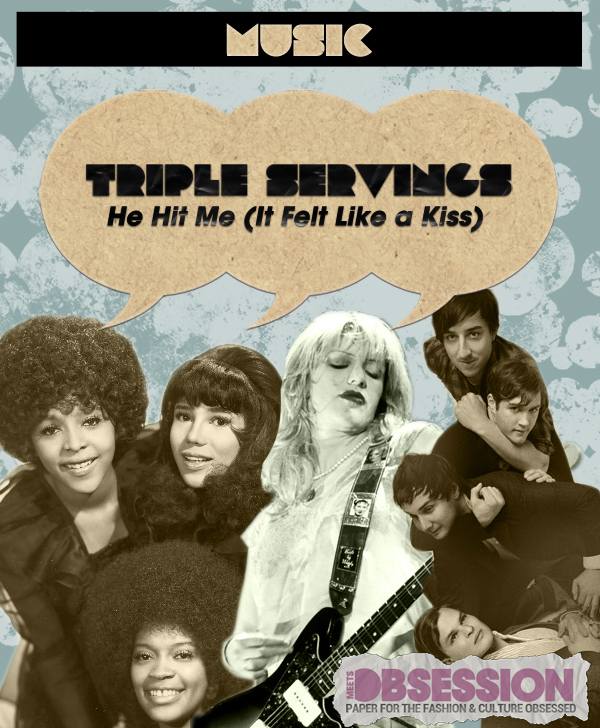 But among all the tracks that blend together with vocals and melody, one track has had marvelous staying power, thanks to its simple lyrics of mad, heart-breaking love: “He Hit Me (It Felt Like a Kiss)” by The Crystals. Started in 1962, The Crystals were a Phil Spector-led group that released pop song after pop song. However, the captivating melody, coupled with Spector’s lyrics of a girl going back to an abusive lover is a tantalizing tale unlike many of the sugary sweet pop tracks of the ‘60s. Taking the song into her calloused hands was lead singer Courtney Love for Hole’s MTV Unplugged performance in 1995. Experimental indie rockers Grizzly Bear recorded a cover of the song in 2007, taking it back to that melodic, hollow place they’ve carved out so well. Lead singer Ed Droste’s pure, deep vocals simply pour out the vocals over top ambient, folksy instrumentals.